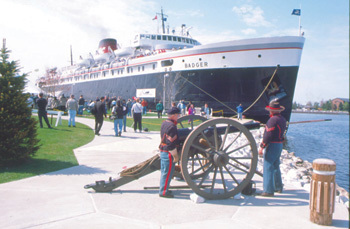 So you've just arrived in Ludington after a relaxing cruise across Lake Michigan on the S.S. Badger carferry. Now what? If you brought your car, you're all set to begin exploring the wonderful town of Ludington, including our beaches, lighthouses, and the Ludington State Park. You exit the carferry dock on S. James Street, with six blocks filled with restaurants and shops. 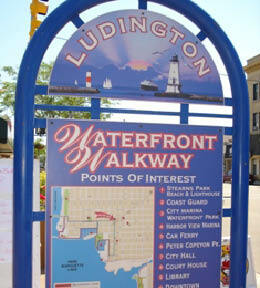 Continue on to Ludington Avenue, which begins from the east at US-10, and continues straight through downtown Ludington right to Stearns beach, where you'll discover Ludington's North Breakwater Lighthouse, the Skate Plaza, and other great features of this charming community on Lake Michigan. If you have no transportation, certain lodging facilities offer free shuttle service. If you're not sure if your hotel/motel/resort offers it, be sure to call them, as many will arrange pickup by appointment. There are also local car rental services and bus transportation listed below. Also check out Public Transportation, and Car Rentals for more information. While you're in downtown Ludington, be sure to take in the colorful murals that are found on the facades of many area businesses. 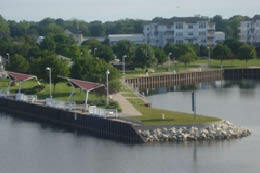 Or spend some time at Ludington's Waterfront Park,nestled between our two marinas. This beautifully landscaped area features nine sculptures, playground, and plenty of tables and benches on which to relax. Stearns Park Beach is a wonderful spot to catch a sunset or walk out on the long pier to the North Breakwater Lighthouse. Ludington is a great place to visit, and it's easy to get around. View this Map of Downtown Ludington for an overview of the business district.